Who doesn't love puppies? Don't we all just love how their big eyes stare at us? Don't we all laugh at their clumsiness and playful attitude? Well, here's the thing, before you get a puppy, please remember that puppies take up a lot of work, especially if you want them to grow into refined canine citizens. Also, there are a lot of puppies and dogs in shelters and pounds. So... before you decide on buying one, consider adopting a homeless dog. As for owners who prefer less energetic dogs, adopting a senior dog should be at the top of your list. Now, back to the puppy story. 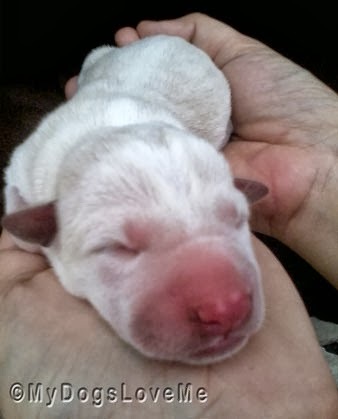 A one day old puppy. And no, those aren't my hands. During Puppy's first day, he can't see or hear anything. His ears and eyes will open in the days to come, but for now, he'll simply have to rely on scent. They'll be sleeping most of the time at this stage. This puppy is learning social gestures. I think he thinks he's going to receive regurgitated food by licking the big dog's muzzle. 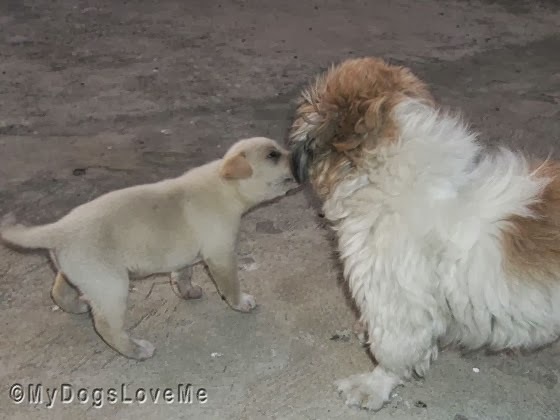 Once he learns to walk, he'll play with others and get a first-hand lesson on how dogs communicate. In a family environment, this includes bite inhibition, respecting the elders and knowing how to deal with annoying humans. This turtle toy or any dog-safe stuffed animal can serve as a great chew toy. They become very curious of their surroundings and are usually impulsive chewers. Toys can save your furniture. 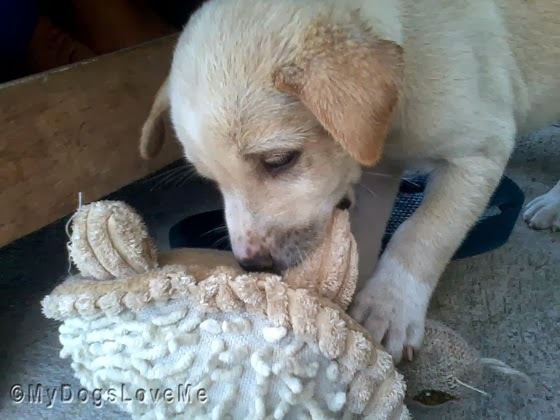 It is important to keep a puppy's mental state stimulated with toys and play dates with other littermates. Remember, a tired puppy is a happy puppy. 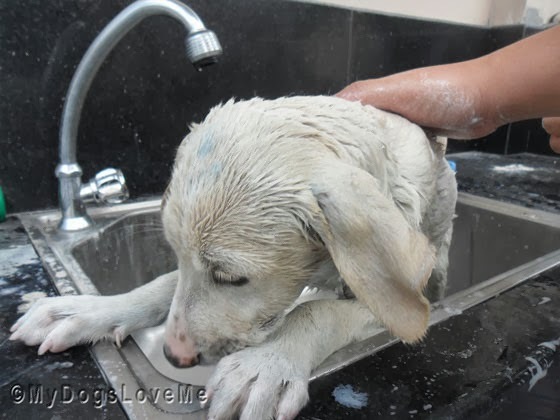 During this time, puppies can begin learning about potty training and crate training. Poor puppy hates his first bath. With a new environment comes new challenges for the puppy. There will be vaccinations, vet visits, neutering/spaying, dog registration (depending on where you live), obedience classes and puppy's dreaded bath! Cute puppy hiding behind the potted plants. Often times, they will hide from you just to avoid baths and vet visits (assuming they already have an idea on how these events happen e.g. human holding a leash, human turning the car on, human bringing in the crate). Once they're vaccinated, exposing a puppy to different environments and characters can help in honing their behavior. Exposing puppies to different people, dogs and environments, desensitizes them from potential foreign objects/being that they may fear. 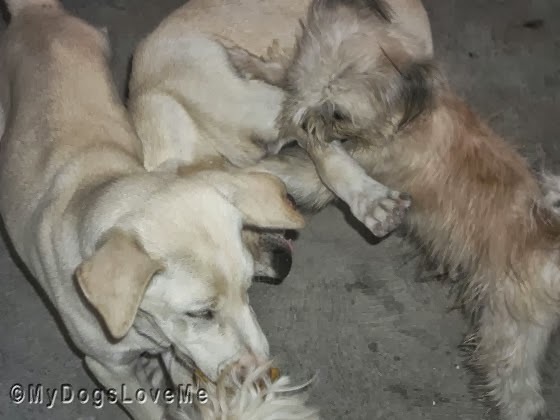 It's a great way to teach them to restrain anger and aggression towards nuisances such as roughhousing and territorial behaviors from other dogs. Here's a good example of puppy toy guarding. Some dogs tend to be aggressive if behaviors such as extreme toy and food bowl guarding aren't corrected. It is important for owners to understand that even when it looks cute and adorable, puppies are still dogs and like babies are needed to be taught proper behavior so the grow up into good dogs. -If you want a dog, adopt one from your local pound or shelter. -If you prefer a puppy, still check out your local pound or shelter. -If you don't want to adopt a puppy, make sure to buy one from a reputable breeder. -A puppy, when raised right, is a great companion. -Dogs have a long lifespan (more or less). Be sure you are ready for a 8-18 year commitment. You are right ... puppies are hard work. Have a marvellous Monday. puppies are a lot of work luckily if you go to a good rescue or breed you can get a puppy at 8 weeks or older and they have some of this done already. A good breeder starts the socilization process for you. We have never had a puppy - always adopt adult dogs. They sure are cute. Like Mr. Pip, we've never adopted a puppy either....although Toby was 11 months when we adopted him, so he was the closest to a puppy. At least in age, in behavior he was a big fat pain in the rear adolescent. LOL! What a great post. I love the photos. I was adopted at 11 months old. Mommy #2 says I was a lot of work but totally worth it. I asked her is she would want another puppy and she said NO! Discussion closed. Good puppy info! Mom says it was just like yesterday that me and Stanley were puppies. But we growed up. Awww, nothing like holding a puppy! My mom and dad adopted me and I am much happier now. I lived at a puppy mill before they rescued me. We all agree with you saying that there a lots of dogs that need homes. Thanks for coming by and visiting my blog!!! GREAT post, Haopee. So many people want to adopt a puppy because they are so cute. But it is SO important to remember that they take lots of hard work and dedication. yes....don't shop...ADOPT! there are a lot of dogs in the shelter. Puppies, ahhh, we remember Siku as a pup! Thanks for advising people to look at shelters which are at times of the year overflowing with beautiful adoptable babies! And remember a puppy is a lifelong commitment! 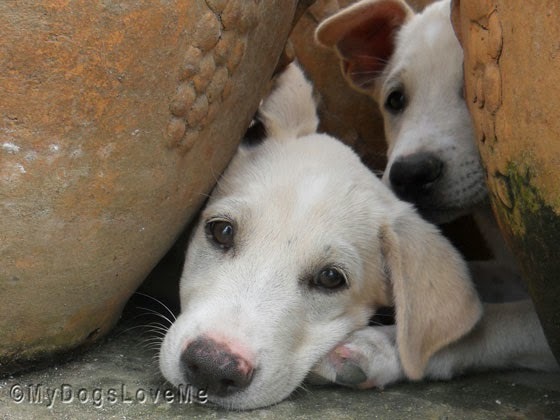 Awesome post, some people forget puppies are SO much more than just a cute face! By the way,if you someday looking for essay advanced-writer.com please welcome! cute puppy! I so loved dogs! My dogs died many years ago, after that I can not want have dog at home! maybe you need some more information about dog, so you can order article on site http://essay-professors.com , by the way in this site you can order any assignments what you need! Very nice site! I like dogs and puppies very much! They are so sweet and clever. I think more articles and researches academic-writings.com should be published on this amazing topic. This is an awesome article article to read. Keep posting such informative articles. These are really innovative in all ways. hacking pixel gun 3d , Keep posting and sharing. Thank you for your post, I look for such article along time. And do you want to leave the virtual worth yourself? If you want, let go to the gamesims 4 cheats. Click link to participate game.